Today, 23rd May 2012 Google has launched a new doodle. This one is different than all. It has both audio and visual interactivity. It is a keyboard, on which you can play, and also record your tone. Google provides facility to share your tone with your buddies, so you all can hear it anytime. This is not an ordinary doodle as it has real working functionality that a Moog synthesizer has. It's a great widget you can say. Very nice work done by Google Engineers. Cheers. This doodle is dedicated to Robert Arthur "Bob" Moog (May 23, 1934 – August 21, 2005). He was founder of Moog Music, was an American pioneer of electronic music, best known as the inventor of the Moog synthesizer. Bob Moog's innovative electronic design is employed in numerous synthesizers including the Minimoog Model D, Minimoog Voyager, Little Phatty, Moog Taurus Bass Pedals, Moog Minitaur, the Animoog ios app, and the Moogerfooger line of effects pedals. This is how it looks. A keyboard device to make your music and a recorder to store it and share it. You can play it with your mouse and your keyboard. You can also set custom values by setting each and every button to the desired output. Mixer, Oscillators, Filter and Envelope - all these has buttons which you can set to your own value and get a sound of your desired output. You can also change these two buttons for different tone generation. 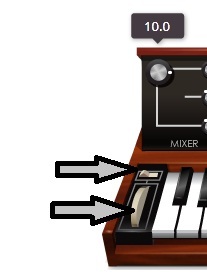 You can record your own made music by clicking the second round red button. You can stop the recording by pressing the first square stop button. You can share it with your Google+ friends on your profile by clicking third button for g+. You can also share the URL to your buddies anywhere on the internet by pressing the last fourth button for link.